Cozido à Portuguesa is a typical Portuguese stew cooked from a range of wholesome ingredients such as cabbage, pig’s ear, porco rabo, blood sausage and other various “unmentionables”. I’m assured it’s absolutely delicious and a real gastronomic delight…err…experience. I’m not normally one to back down from a challenge (except for eating snails and oysters),but as I’m already leaning towards becoming a vegetarian I won’t be cooking Cozido à Portuguesa in the foreseeable future. I have therefore included a link to the recipe below for when you are tempted. The photographs are courtesy of a friend who ordered the Cozido à Portuguesa for lunch (which he thoroughly enjoyed) while the rest of us wimped out on grilled salmon or pork kebabs. Mr. Piglet made us laugh as he built a screen using the various condiments, wine and water bottles to avoid eye contact with the plate of delectable unmentionables. Mr. P is a bigger wimp than I am ,and also “eats” with his eyes! Thanks EC, I’m getting there. I’m thinking more of a lifestyle choice. I will never understand why this is such a popular dish among the Portuguese. I’ve always been a bit squeamish about icky bits on meat so I suppose I’m not the best one to pass judgement but my husband, who isn’t nearly as fussy, can’t handle some of the oddities that you find in cozido! Hi Dawn, it is a strange concoction, but then I suppose in an era when many people lived off the land I can understand why using every part of the animal was so important. I just wish I had the courage to taste it! I have tried it a couple of times and there are some bits in it that are fairly lean and edible. And it is quite tasty in the scheme of things. I give anything suspicious a wide berth though and I’m in no hurry to have it again. One meal I cannot manage to get my non-Portuguese stomach to accept…even after nearly 30 years of marriage! Hi Ark, I suppose that’s one way of putting it! There so many wonderful and delicious Portuguese foods one can eat, why torture oneself merely for tradition? Snails I will eat. This, I’m not sure about! It sounds too gruesome. Hi Maire, I am assured by our friend whose meal we photographed it is delicious! Wow, so surprised, that you would not try real Portuguese dish.Cod fish dishes are not the only dishes of Portugal. 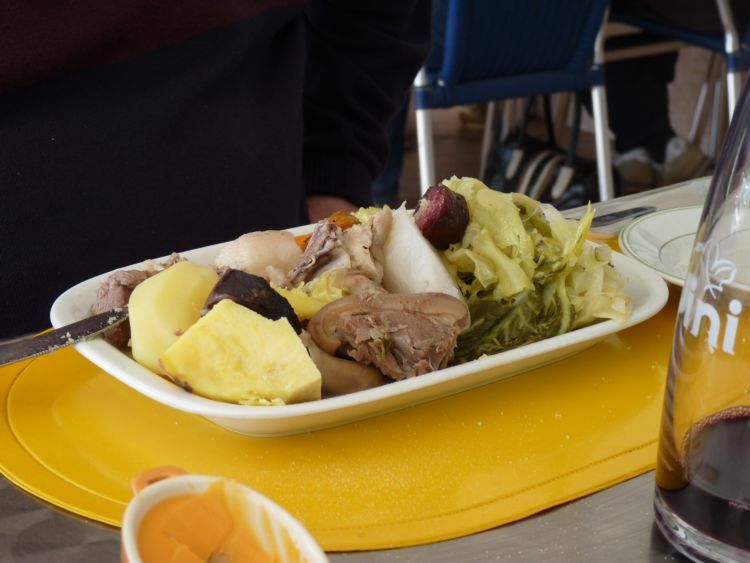 If you ever go to the Azores, specifically, the island, Sao Miguel, where people from all over the world, flock to eat the cuzido, that is cooked in the earth,it is the most healthest food, the most tasting , nothing compares, to having your food cooked by mother nature. Sure beats that discusting Haggis and some other grossly looking dishes from other parts of the world. To an extent I’ll agree with Maria but will stop short of recommending the offering in Fornas on the island of Sao Miguel. What Maria failed to mention was that the area is a geo thermal hotspot and the mud bubbling from the earth carries with it the most disgusting sulphurous smell which permeates the food. 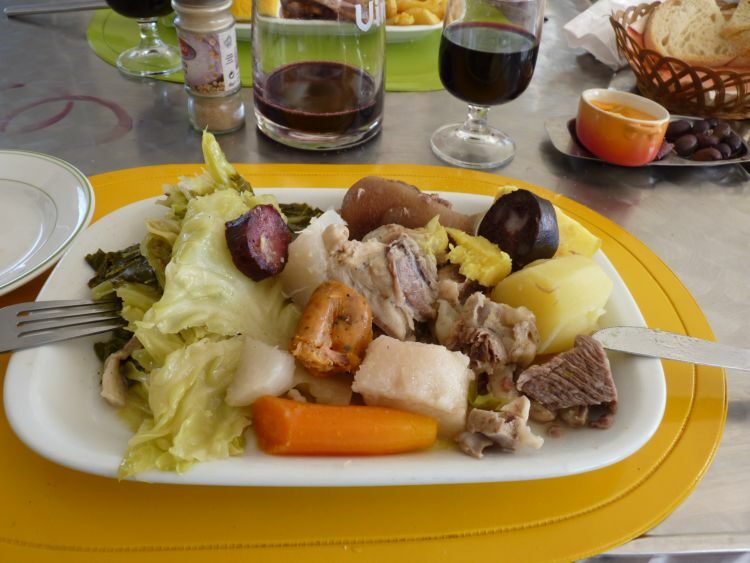 Sao Miguel has so many offerings in the way of food but I’m afraid that for me the Cozido is not one of them. The cheese is well known and an excellent replacement for Cheddar and I loved the chicharros (small mackerel). But did you know that Sao Miguel is the only place in Europe to grow tea and it is delicious? Coming back to the cozido what’s not to like? The only ‘odd’ bits in it are the feet and ears of the pig. The feet are mainly bone but with lovely porky pieces attached and the ears? Well I have to admit that I’m not a fan as they are so chewy but the rest is beef, chicken, sausage and other porcine lovliness. Go on. Give it a try. You know you want to! Hi Colin, I’d like to taste the cheese and small mackerel you mentioned but the stew – no way! It would be like eating myself! It certainly looks good visually on the plate! Really? I think you have a similar stew in France, non? OUI – boudin is popular here, as are the other odd parts of animals, not to mention snails, frogs, and tripe! Hi beyondlisbon, and welcome 🙂 I think the key here is as you say “and having eaten ‘cozido’ since I was a kid” if you are brought up to eat certain foods they do not seem strange. I could eat something made with chicken without the weird bits and pigs ear and the rice option also sounds good. if you have that recipe please, I will certainly try it. Hi ad, looks like there may be an alternative! Shut your eyes and it is delicious! The only thing I don’t like about Cozido à Portuguesa is the large quantity of white cabbage that is a part of the dish – reminds me of school dinners. There is a similar portuguese dish called Rancho which substitutes the cabbage with feijão (white beans); now that’s really tasty, but again requires a blindfold! As dose the haggis, …. Is that allowed on a diet? I can understand the objections to Cozido as it doesn’t look very appetising, but I’m really surprised at the negative comments about haggis. OK it’s contained in a skin, no different to a sausage, but the contents are finely minced lamb and oats – it doesn’t look much different to muesli which healthy types rave about and which I think tastes disgusting. You can even buy vegetarian haggis in English supermarkets, although it’s dry and tasteless compared to the real thing which is peppery and really tasty. If I took the pastry off of a cornish pasty there’s little difference apart from the pasty being baulked out with potato. Don’t be put off by rumours – give haggis a try and you’ll love it! And I’m English, not Scottish! Hi Chica, reading Lisbon’s comments below it sounds similar to an English stew made with cooking steak and vegetables. I am so sorry to ‘annoy’ you again by admitting I have been laughing aloud and NOT understanding throughout the wonderful blog! OK, not having any Portuguese the obviously wonderful recipe will have to be picked up in another language soonest! Have never had cocido!! What on earth is wrong with an animal’s ears and hoof areas, if I remember correctly? Surely the most taste and the most gelatin ? Methinks it will have more taste than haggis 🙂 ? And I have NOT had this since childhood, but it sounds SO moreish!! Life is for living, food is for tasting and enjoying 😀 ! Carole, I’m also quite squirmish about the odd bits, so I only make Cozido with chicken, beef and the sausages. You can vary it to suit your tastes and it’s still good. This really made me laugh. One of the first dishes we had here was this. However your pic looks quite presentable. Ours was in a huge dish floating in a sea of grey broth with greasy globules scattered amongst the meat and veg. I took one tentative bite and couldn’t eat it. Mr Mista, being the kind soul that he is, did not want to offend the lovely restaurant owner who had presented this dish with such pride. So he took to the task of eating it all. We were surrounded by elderly folk who were eating this dish with much noisy, slurping, spitting gusto which made me feel so ill I actually gagged and so also had to do the screening thing by pretending to look at our road map for the entire meal. Mr Mista eating it all reminded me of that scene in the TV series All Creatures Great and Small where James Herriott is trying to eat a plate full of fatty ham in front of the proud farmer and his wife and ends up covering the inedible meat entirely in piccalilli to try and disguise the taste! Poor Mr Mista! He is a real gentleman 🙂 I remember that James Herriott episode absolutely brilliant! IT reminds me of the time when I first tried clams. I do actually like them now but it was only the fact eveyone was watching me as I examined it on my folk, then I had to cut the eyes off before I could put it in my mouth! I can’t eat anything with eyes! i) this is something that is usually cooked in big amounts because it’s normally eaten at family gatherings: everything will go to the table in separate plates and each person will choose what they want: you might love farinheira but your brother prefers chouriço de carne, while your auntie would rather have morcela and your sister always goes for the chouriço de sangue – all options are good, as long as you like it! I’m interested in the beans on the side. Do you mean white beans as you would have in feijoada (or black Brazilian equivalent) or do you mean green beans in the pod? Neither, actually. It’s red kidney beans (feijão encarnado). Thank you with sugar on top: quite out of the blue I am reading so many variations to add to my trials and tribulations of this way Down Under! And, yes, I’ll try them all: love some of those details!!! Dreadfully sorry, and hope you will forgive me, but have been to your blog and am following: shall try ‘to behave’ 🙂 ! Don’t worry about the ears Piglet. It’s when you get round bits you need to start worrying! Oh no! I def cannot eat the eyes! Hehe…:) If I were you I’d be walking round with my legs crossed! Yes, there are several types of morcela, but if and when I really have to eat it I prefer it grilled (tastes!). I’m actually considering having a food/recipe category about Portuguese food on the blog, since I see so many misconceptions going ’round the internet. By the way, if and when you do become a vegetarian maybe you could try a few traditional vegetarian dishes. Yes, they do exist, particularly in the Alentejo. English people never stop to surprise me. They make objections to the pig ears, but enjoy fresh sausages and ready made lazagna, with bits of horse and other stuff they don’t even know whats it is. A challenge for me would be to have fried mars bars covered in egg at breakfast….that is challenge. There are some great British recipes and some really awful ones! Just like Portugal. I don’t like many of them 🙂 As for Horsemeat in Lasagne I think you will find some supermarkets in Portugal have also been affected. PErsonally I don’t like ready meals becuase you don’t know what is in them. Sausages….I prefer not to know, but I’m eating less and less of this type of thing now. I find the fresh meat in Portugal so much better than that of the UK, in fact in general I only try to buy Portuguese fresh produce. All this chatter on here, because of the comments I made-wow-lol. It was the first time I had posted. However have been following yr blog for sometime now. I live in a city that has a large # of ppl who are Portuguese or claim it as their heritage, with pride. A great thing happens here, there are many healthy take out restaurants, one being Portuguese food.Interestingly their food aways sells out, one of those high the list is the. COZDIO. As for the Morcela (blood sauage)I love it, but as some one said it is made differently in different parts of Portugal, I do not like the way it made in continental Portugal, with rice and cinnamon added to it.I love it the way it is made in the different parts of the Azores. Here in Canada, it is very expensive, it sold by weight. Eyes, lol could never eat great healthy fish stew, because the whole head is used, did not want to be looking at those eyes and did not like the smell of the herbs used-lol However I did try it. Sometimes things dont looks so great, but I think we should try things, in small amount, we never know when will love something or hate, but only then can we can truly comment on it. Long live the pigs ears, yummy! Ps:Piglet do you have your blog going to facebook? Hey Maria, with a name like Piglet eating pig’s ears would be like eating myself! LOL 🙂 I think it is important for any nation to be proud of their heritage and not lose sight of it. Foreigners do not always understand but it is as you say important to try (well some things). There is so much about the “old” Portugal I do not understand at the moment but looking at the old farmers where I live I am beginning to understand how hard life has been in the past. And no doubt this is tied in to dishes like the Cozido. Re Morcela that is something else I have learned. I thought there was just one type. My FAcebook link is on the RH side of my blog. It’s my personal one. Just send a friend request. I’ve not sure how to set up a FB page. I’m, pip portugal on my persoanl one. I’m an adventurous eater, but sometimes it is best not to know what is in a particular dish. Awesome food, The blood sausage are really made of blood ? I love Cozido! Seriously a treat!